Your credit score in 2008 is very important when it comes to buying a house. Heck your credit score is important when it comes to getting a loan period these days. Since the sub-prime mortgage meltdown, Wall Street has tightened up on what kinds of mortgage paper they will buy. Most loans are run through automated underwriting engines. The underwriting engine will either say yes or no, but here is the funny thing. Even though the engine says yes, the investor may have its own internal guidelines that would overrule an automated approval. This is not normal in the loan business. During the past years when you got an automated approval with either Freddie Mac or Fannie Mae underwriting engines you were golden. Since all the tightening up in the lending industry, the companies that insure these loans have tightened up as well. The reason for this is all the claims that are being filed as a result of defaults on mortgage loans. I have discussed in other articles how everything basically is based on risk, well so is insurance. If the insurance company sees a pattern with certain credit scores and loan types they will tighten up on the underwriting guidelines for those specific borrowers. Currently you cannot get a 100% Conventional prime loan unless you have a 680 credit score. Previously it was below 600 credit scores, but you had a higher interest rate. Currently they will just deny you of the loan, because they cannot get the loan insured. This mortgage crisis will affect everyone, including people with good credit. They will be able to get loans, but the loan guidelines will be more stringent. FHA loans have been around since 1935. This government entity is the single largest insurer of loans in the world. FHA has baled the housing industry out of the tar pit right after the great depression. It looks like the same savior will be at it again in 2008. FHA loans have not tightened up, but again the investors that buy this paper have. Its common for banks to sell there loans to other banks. This is just a common practice these days. The only problem is the big banks buying paper from the small banks have really tightened up on what type of loans they will buy. With this being said, the entire process is getting tough all around. Your credit scores will either make you or break you when it comes to getting credit extended to you. With the disaster in the housing market, you can count on it getting even tougher with credit score requirements. So if you are in the market to get a home, I would recommend getting a copy of your free credit score report and see where your scores stand. Your score will be extremely important in this current lending market. About the Author: Mike Clover is the owner of http://www.creditscorequick.com/. 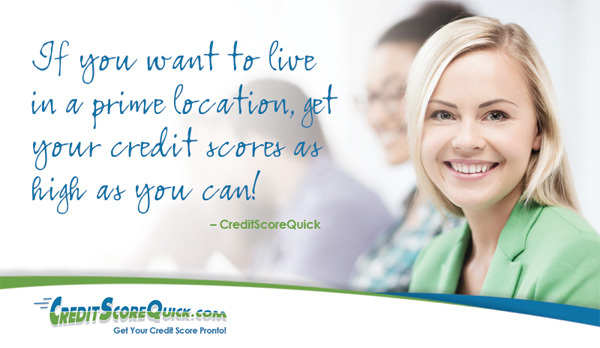 CreditScoreQuick.com is the one of the most unique on-line resources for free credit score report, fico score, Internet identity theft software, secure credit cards, and a BlOG with a wealth of personal credit information. The information within this website is written by professionals that know about credit, and what determines ones credit worthiness. If you’re applying for a loan or credit card, your credit score could have an impact on your interest rate and loan term. So what is your credit score and what does it mean? What does it say about you? Credit scoring is how creditors or lenders assess their risk when lending money to you. They look at your score and it indicates to them how financially responsible you have been in the past. Your credit worthiness is calculated by credit scoring agencies and bureaus. You should get a copy of your credit score at least once a year and make sure that there are no mistakes or omissions in it. You can get this information for very little money and sometimes for free. Your actual score will be between 300 and 900. Higher scores are much better and can get you great interest rates, longer pay-off periods or terms, lower fees and less paperwork in the application process. Low scoring applicants are usually rejected all together or they are offered high interest rates, high minimum payments and more fees. Sometimes low scoring applicants are accepted based on their employment history or other factors, but generally aren’t as trustworthy as their higher scoring counterparts. Is your score a good score? 650 or higher is a very good score and will generally earn you the very best terms when applying for loans. If there are a few minor problems with your credit history, such as a couple of late payments in the last few years, then you can score between 620 and 650, which is still a good score. You may run into a few problems with this score, but generally it is still pretty good. You’ll probably end up with slightly higher interest rates than people with excellent credit. Scoring under 620 puts you into a risky category. You may still be approved for a loan, but it will be at the highest interest rates and you may be considered a big risk to lenders. Things that affect your credit score include your borrowed money payment history, late payments and missed payments. Late and missed payments on a credit card or loan are very big considerations when calculating your credit score. You should try to never make a late payment because it blemishes your record for years. Another thing considered when figuring your credit score is your debt to income ratio. If your level of debt is very high relative to your income, or if the cards you have are close to their spending limits, then your score will probably go down. If your credit history is very long and you’ve had revolving credit for years, then your score may drop. Trouble paying things off completely makes you look like you are in over your head, or you’re just not trying to pay off your debts. Inquiries on your credit are another thing that is looked at. If you’re constantly applying for credit cards and loans, regardless of your acceptance or use of the instrument, then you look like someone who can’t afford the things that you’re trying desperately to get. Do your research before choosing a loan or credit card to apply for. Multiple inquiries on your credit can hurt you in the long run. Your credit score ultimately depends on you. You are currently browsing the archives for the credit worthy category.